Good customer service is a thing of the past, as a general rule. It seems that when dealing with just about anybody in the service industries, giving good service is a lost art. That said, I had an experience last week that was well worth sharing with you. About a week ago, I ordered a pizza from Pizza Hut for dinner. My order was not monumental. I ordered a large pan crust pizza with half Italian sausage and half pepperoni. I also ordered extra cheese. I went to pick it up. Mind you, I have been going to this Pizza Hut for years. The service has generally been pretty good. I have always been surprised that several of the team members have been the same for years. It is a small Pizza Hut that does carry-out and delivery only; there is no dine-in option. This time, something was wrong. I knew it from the minute I got in my car with the pizza. It didn’t smell like Pizza Hut. It smelled “off.” I thought to myself, “You are crazy, Denny. Your hunger is screwing with your mind.” So, I went home with the pie. When I took the first bite, I knew I wasn’t completely losing it. There was something wrong. After a couple of pieces, I couldn’t do it anymore. The sour taste was really bugging me. I can describe it as tasting “old.” I threw the rest of the pizza away. This was a rare exception. I emailed Pizza Hut via their website the next day. I explained the situation. I detailed how I have been a loyal customer for years, and that I do not like to complain, but that something was off with this pizza. I requested my money back, so to speak. I didn’t really expect a monetary refund, but I was hoping for a replacement pizza. And I would wait until the old cheese was gone before ordering again. In reality, I didn’t expect much. I sent the email, but didn’t really expect to hear anything. To my surprise, less than a day later, Pizza Hut emailed me. The email mentioned that they were sorry for what happened, and would be mailing me a voucher for a free pizza with up to three toppings. This was actually more than I had ordered. Nice. This is excellent customer service. 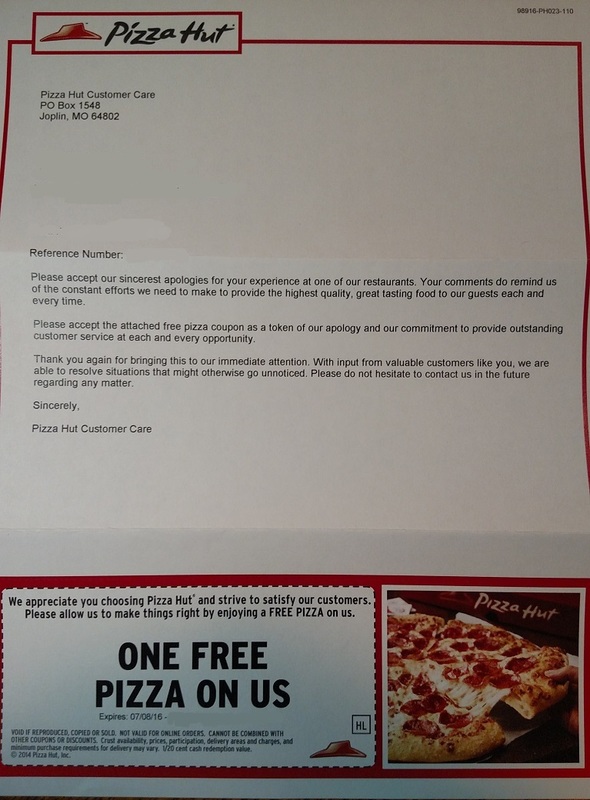 Something was wrong, I brought it to Pizza Hut’s attention, and they made it right. The company responded in a timely manner, and did what it said it was going to do. This never happens anymore. I was impressed. Thank you, Pizza Hut, for making it right and doing as you said you would. I appreciate the care for your customers. I will continue to frequent my local store, and other Pizza Huts as well. Think of this, fellow snobs, the next time you deal with Pizza Hut. The company did the right thing, and that is not standard anymore. You’ve won me over, Pizza Hut.